This family is loosely traced back, but not proven to John Julius, of Nth Yarmouth, who, in the 17th C, was a sugar planter on the Island of St Kitts, (St Christopher) West Indies until the French took his estate c1665. His son Capt William Julius RN was honoured with burial in Westminster Abbey for his success in capturing French naval "Prizes". A second son John was the Capt of a Privateer "The Fancie" and lost his life in action against the French in 1697. John's grandson William leaves a clearly verifiable presence on the Island from the early 18thC, his descendants worked the land with their slaves, becoming wealthy and influential. The family kept strong links with England where many from St Kitts lived in the 18thC, but they also spread out across the world, particlularly to Australia. The last of the family on St Kitts, Sarah Ann Julius, died unmarried in Basseterre in 1907, some 250 years after their settlement. The pages that follow contain a minutiae, plus stories of duels, highwaymen, inventions, entrepreneurship and service to their fellow man. St Christopher or St Kitts as it became early in the 18thC was first recorded by the Spanish but what name it was initially given is far from clear, as it appears as St Martin on some maps late into the 16thC. Increasingly the Spanish lost their grip on the region and in 1623/24 Sir Thomas Warner settled what was the first British Colony in the West Indies. However about the same time the French landed to settle, this was resolved initially by a treaty in 1627 dividing the island. The British took the central portion, and the French the two extremities calling it St Christophe with "Basseterre" their capital. The original English capital was "Old Road Town". Tobacco was the first crop from St Kitts until Jean Auburt of Rouen introduced the cultivation of sugar in 1640. John Julius's dates and details are unproven, it is significant that there is no mention of a Julius in the Caribbeana records for the 17th & early 18thC. This was a very turbulent period for the Leeward Islands, France gained control of St Kitts three times; between 1665 & 1667; between 1689 & 1697; and between 1705 & 1713 when after the Treaty of Utrecht, Britain finally took control of the whole Island. However the re-allocation of land and other changes moved at a glacial pace, the islands continued to be invaded from time to time reflecting conflicts in Europe and North America. If John Julius in fact died in New York in 1671 he may not have restablished himself as a planter in St Kitts, and was working as a sea captain out of Nevis, most of the basic supplies for the Islands came from Nth America until the War of Independance 1775-1783. At that time the French Navy supporting the Yankee's plundered in the West Indies, and trade with America ceased. Petitioner to the King and Council 1668. Petitioner for divers years an inhabitant of St Kitts until the French took his whole estate, but not withstanding, that said Island is again surrended to the English. Prays leave to transport himself, wife and family, and L150 in goods from London to Middlesborough where a passage offers for said Island". Ref:Transcription c1960's by Nancy Hadwen nee Fenn. Julius Jottings No. 6 Jan 1902. "In 1883, I chanced to be in the Record Office in Fetter Lane, and I quite accidentally came upon this notice, that in 1668 one John Julius was paid a sum of money by the King (or the then government) to bring himself and his family from St Kitts to the North Yarmouth, which presumably was his home in England. At this distance of time, I cannot remember for certain, if the money was given to this John Julius to go to St Kitts with or to return, but I wrote down the date and name and have it before me now in my diary of 1883"
In the light of the above, this appears to have been a mistaken memory of the petition. Sir George Julius's and Nancy Hadwen's transcriptions all had the date at 1668, but the book "A Power in the Land" puts the date at 1688, the collator has not seen the MS only the transcription above. However the date of 1668 has been taken as correct as it is the date agreed for the return of St Christopher to English rule in the Treaty of Breda which brought the Second Dutch War to an end. The French were allies of the Dutch in this conflict. Appeared before me, Nicholas Bayard, Secretary to the Worshipful Mayor's Court, Captain JOHN JULIUS, commander of the ship called the "Loyal Dorothy," at anchor in the harbor of this city. Being sick. Appoints Gabriel Minveille executor, giving him especial power to manage the ship and cargo of the " Loyal Dorothy." Mons Gabriel Minvielle admitted administration of ye goods and estate of Captain John Julius late commander of ye ship Loyall Dorothy of Nevis. These are to Certify all whom it may Concern that ye said Monsieur Gabriel Minvielle is hereby declared Allowed of & Confirmed to all Intents & purposes Executor of ye last Will and Testament of ye said Captain John Julius deceased; So that he hath hereby full Power & Lawful Authority to enter into possession of & take into his Charge & Custody all ye Goods & Estate in these parts which did belong or in anywise appertayne unto ye said Captain John Julius at ye time of his decease; whether relating to his own particular Account or in Trust either on board or on shoare, and to dispose thereof for ye best advantage of ye Owners and Persons concerned & all other lawful things to Act Doe & Execute according to ye terms of ye said Will as Executor by ye civil Law & ye laws of this Government are empowered to doe; with this Proviso, That in regard ye Instructions which ye said Capt John Julius deceased had were given by Sir Charles Wheeler Governor General of ye Leeward Islands to whom together with his friends at Nevis the greatest part of ye Cargo doth belong & that ye ship the Loyall Dorothy doth appertain to his Matie (moiety?) some person of Trust by me appointed thereunto be joined unto ye said Gabriel Minvievlle to see a just and due Administration of their goods; And that the Return thereof be with all Care sent back together with ye said ship according unto ye Instructions given by Sir Charles Wheeler as is aforementioned. Abstracts Of Wills On File In The Surrogate's Office City Of New York. John is thought to have had two marriages, of a first, nothing is known. Little is known of John. His family remain entirely unproven, linked only by the reference to a family in 1668, and the Capt John Julius above whose will in 1671 mentions a widow but she is not named. 1. Although there were registers of the enslaved for the period 1817 to 1834 most of them were registered without a surname. 2. Not all enslaved or even freed persons joined churches. which means that they only records of them would have been plantation records. 3. No plantation records survived in St. Kitts. Those that survived are the records and correspondence that were taken/sent to England. I suspect that this is due to a number of reasons. Plantations changed managers often and they might have taken records with them when contracts ended. St. Kitts is prone to hurricane damage so many records may have been lost when buildings were damaged. Being tropical St. Kitts has many pests that attack wood and paper and many people probably chose not to provide them with food and destroyed records when they were no longer needed. 4. Children were often known by the name of the father but if there was not a formal marriage, the father was rarely listed in the record of birth or baptism even if the couple lived together. This means that the child would have been registered by the mother's last name. If this is not known, then it becomes very difficult to trace the family back." 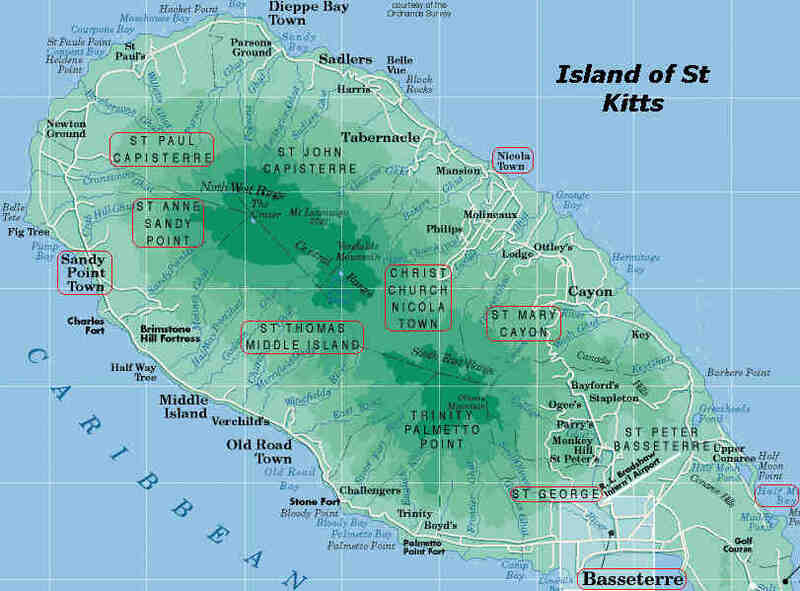 Ref: Map of St Kitts courtesy of Ordinance Survey & Cartographics LLC. Julius places of interest marked in red. St Kitts with an area of 176 sq km (30km x 8km) is the largest of the three Leeward Islands of Nevis and Anguilla. It is of volcanic formation rising to 1156m with fertile soils an equitable climate and good rainfall. From the early 17thC the Administration of the individual Islands had been in the hands of locally appointed Councils from the Planter population, they, over the years tended to a parochial view while preserving their own rights and privileges. As the white population fell, particularly in the 19thC, the quality of this leadership further eroded. After England secured control over all the islands in the late 17thC it did not appoint a centralised Colonial Administration but for the most part took a laissez-faire approach, leaving the Island Councils in place overseen, often with mixed results by a Governor General of the Leeward Islands, appointed from London. As a result there was little evidence of a vision of nationhood in the decisions over the years, and infrastructure and Civic amenities remained primitive. The following account was presented to their Lordships in 1675, having been drawn up and signed by the principal inhabitants and planters of St. Christopher's. St Xp'hs land. Aprill 29th 1675. Narrative of the first settlement of St Xp'rs. How was ye Island of St Xp'hs first Inhabted by ye English & by the french, & how it was shared betweene both nations? The Island of S' Xp'hs was first settled by ye worthy & renowned Capt. Thomas Warner (afterwards Knighted by King Charles ye first) with seaventeene other persons Gentleman adventurers with him in ye yeare 1623, who when they came to Settle found a french man upon it amongst ye Indians & went naked as they did named Peter Cotty putt on Shoare out of a Shipp for recovery of his health, in a Short time after came a french Gentleman with a certaine number of french men with him named Mon De Numbec betwixt whom & S't Thomas Warner ye Island was devided & one halfe for the English & ye other halfe for ye french from white flag bay being ye westerly p'te & friggett Bay being ye Easterly p'te of ye Island ye midle of both which sides fell to ye English nacons lott which said Settle't Continued in peace & good amitie, untill ye yeare 1629 theire being certaine Articles made betweene ye said governor to assist one ye other against any enemy ye should oppose or invade ye, all w above declaracon ye declarants affirm & ye they have from time to time received from Coll John Bedingfeilde some time governor of ye said Island for ye English nacon, & ye aforesaid Peter Cotte of ye french nacon, ye aforesaid Coll Bedingfeild, being one of ye first seaventeene English Settlers ; & in ye yeare 1629 one of ye s'd declarants by name Leiu Coll William ffreeman now here resident came to this Island St Xp'hs ; from Lond. in ye good Shipp called ye Carlisle Com'and in cheife Capt. Henry Hawly & one Geo. Deinnis master, & ye s'd declarant further Sheweth ye after a moneth or there abouts came a powerfull fleete of Spaniards of about 37 Sailes who surprized & tooke most of of Shipping & came to an anchor at Shambers roade in ye french quart & ye next landed most p'te of theire forces, Sir Thomas Warner beinge then in England, had left his Sonn Edward Warner to be his deputie governo' who ac- cording to Articles caused all his able men to be drawne up in armes, & com'anded them to march to Basseterre to assist ye french, who being theire ready in armes to resist their enemy desired to have ye van w was granted ye, ye Capt. or Com'and of the said Company leading on Couragiously upon ye enemy, It was his fortune to be ye first shott & died, ye Company seeing him fall fled p'sently away to sandy point as fast as they could throwing away their armes along ye way as they went, & ye English re- treated in order to theire owne quart ; The next day following were Gentl Com'ission sent from ye English on board to treat of peace & ye treaty was concluded ye english were all to goe of ye Island & were to surrend up ye Island, Artillery armes, Amunicon & all merchandize, only excepting all sorts of apparell linin & woollen, & ye Spaniards to furnish ye shipping for ye transporte of their people for England. There was att ye time a privateere of ffrance named Geeroon, w two or three Shipps, who tooke on board his Vessells all ye french ye were upon ye Island att Sandy point & carried ye away from ye Island untill ye Shipping were all gone. There was one of ye eighteene of ye first english Settlers named Morris Gardner who fled into ye woods, w severall others & stayed upon ye Island untill as well ye Spanish Shipps as those ye were to transport ye english were all gone, after w those ye fled into ye woods assembled togeather, & made choise of said Gardner to be theire governo in a short time aftere ye said Geroon returned to ye Island w his shipping & all ye men he had carried off & by a wilde forceably landed ye againe. Before ye prission gott home for england, Sir Thomas Warner returned againe & Settled ye Island in ye yeare 1630 ye aforesaid Leiu Collonell ffreeman returned again & did continue an Inhab't upon ye Island from ye time till ye fatall yeare 1666 in all w time ye two nac'ons continued in good Ametie. And in the yeare 163.. there was a Settlement made by one of ye english att ye great salt pan, by name William Sumers, but their being noe water to be had w out much labour & toyle ye Settlers left ye s'd land & went to ye Tartoodes to Settle there ; In ye time of Coir Clement Everards governm the great Salt pan was devided betwixt ye english & ye french, but noe parting of any of said land betwixt frigott bay & St Xp'hs point to this day. In testimonie whereof wee have hereunto Subscribed our names being thereunto Called this 29th April 1675. William ffreeman. John Estridge. Rob't Cave. Charles Morris and others. During most of the 18thC sugar prices were good and with slave labour yielded high profits, this allowed for the payment of attorneys and managers to run the properties while many plantation owners stayed in Great Britain or removed there. However as more sugar producers worldwide entered the market in the 19thC prices fell as did Leeward Island plantation profits. Because of a high level of absentee ownership, plantations were unable or slow to adapt to alternative crops, or meet the market with more efficiency. This resulted in great impoverishment of the population. Then came the Emancipation Act of 1834 and in its aftermath land prices fell with an aggregation of Estates, strikes became commonplace, as did the emigration of freed slaves creating labour shortages. The enormous compensation paid to slave owners by the British Government had a very uneven effect on relieving these difficulties. Ref: Out of the Crowded Vagueness by Brian Dyde 2005. It appears fair to say that the Julius family enjoyed the profits from their estates in the 18th, many removing to England where they established themselves and lived comfortably. Those that remained on St Kitts would no doubt have suffered from the fluctuations in fortune of the sugar industry, and the great social changes in the early 19thC. Let us hope that the vein of goodness and respect for their fellow man, which modern generations of Julius descendants have displayed to this day, was present in Julius slave owners. Little remains in the record of their participation in the society with a few exceptions, the most prominent being the Hon John Julius 1768 - 1815, who to his credit when Council President was forthright in seeking the prosecution of the Rev William Davis for the murder of a female slave. Although, unsurprisingly found not guilty by a jury of his peers, the publicity this trial generated in England no doubt fuelled the arguments of the Abolitionists. It is sobering that the last member of the family on St Kitts, Sarah Ann Julius 1837 - 1907, died in genteel but dire poverty in Cunningham Hospital, Basseterre, where she had lived for over 20 years. What comforts she enjoyed at the end of her life were supplied by family in England, her letters in this record made most interesting reading. Sugar production in St Kitts continued until 2005. Primary sources for this Family History include Julius Jottings, Florence Stevens, who early in the 20th C., gathered data, particularly from St Kitts. Florence passed her research on to Sir George Julius in the 1930's, he continued the work and produced an extensive series of 8 drop charts and notes dated 31st March 1939. These set out much of what was known of the genealogy of the family to that date. Awdrey Francis and Jenifer Mary Julius, son and grandaughter of Sir George, and Valmai Maria Julius, daughter Stanley Villiers Julius have continued the research, producing much of the genealogical and historic data in this record from 1939. In 1995 the collator of this Tree, Edward L Fenn, started to draw together the various collections of the family's history, including that held by the Fenn's, and his own research, into this digital record. The project is ongoing. Images of family members have come from the above, and a wide variety of other sources. By the courtesy of Alick Julius of NZ (no relation to this family) a file of research by Audrey Fysh and her husband John, of 37 Lime Tree Grove Croydon SRY, came to the hands of Edward Fenn. Done in the 1980's, it is not at all clear why the Fysh's were interested in the Julius family of St Kitts. They corresponded with Betty McGrath late of 35 Mill Drive Nth Rocks Sydney, who wrote an extensive work on the Brabyn family in Australia. The file contains valuable transcriptions and data on the Julius family, from the Society of Genealogists London, and other sources. This added to the history and enabled corroboration of data recorded in the 19thC and early 20thC. Caribbeana is a vast resource for information on St Kitts and Nevis. In a review of it in 2015, lists of 17thC marriages contained no Julius name (Vol 1) nor do lists of inhabitants of St Kitts, 11 Jan 1707/08, or Nevis, 13 Mar 1707/08 (Vol 3) or Montserrat 1730 (Vol 4). "Genealogy : West Indies" by Genealogist Florence Stevens (nee Julius). "Julius Jottings" a private publication of seven issues, published in London by family members between January 1900 and January 1902. "A Power in the Land" by G & A Elworthy a biography of Churchill Julius published by Whitcombe & Tombs NZ in 1971. Searched on internet 2009 no Julius, few English names: Internet:http://translate.google.co.nz/translate?hl=en&sl=fr&u=http://www.ghcaraibe.org/docu/st-chr/1671ter/p00.html&ei=5l1RSp2QFImssgPe9KmhBQ&sa=X&oi=translate&resnum=1&ct=result&prev=/search%3Fq%3DRecensement%2Bde%2Bl%2527Ile%2Bde%2BSaint-Christophe,%2Bann%25C3%25A9e%2B1671%2B:%2Bliste%2Bdes%2Bpersonnes%2Bfigurant%2Bdans%2Ble%2Bterrier%26hl%3Den%26sa%3DG. Military Governments in Great Britain. Berwick . . . . .Carlisle. . . . .Edinburgh Castle. . . . .Isle of Wight. . . . . North Yarmouth . . . . . etc. . . . . .sergemaker, and removed from thence to Norwich, Ipswich, or North Yarmouth, is desired to repair to . . . . .
"Then came war and most of the English settlers were expelled, c 1664, but by 1713 the whole of the Island with Nevis to the south had passed by conquest, and treaty, back into the hands of the English and many planters had returned, including John Julius, who returned to Nevis." A Mr John Bromley was married to the daughter of Mr T H Berkeley of St Kitts and Antigua, most of the families there were known to them. On a visit to St Kitts in 1912, Bromley made copies of most of the Registers for Florence Stevens  nee Julius. However he found that some of the older Registers had been destroyed by fire. Searched 2012 no record of a Julius. The Colony of St Kitts was settled both by the British and French in the early 17th Cent. it was first divided into Quarters, or Divisions, which appear to have been Military Districts. Later six parishes were formed viz. Trinity, Palmeto Point, St.Thomas Middle Is. and St Anne's Sandy Point, on the Leeward side; and St. Johns Cabbesterre, Christ Church Nicola Town and St.Mary Cayon on the Windward side. After the war in 1727 three further parishes were added out of the French districts; St Pauls Cabbesterre, St Peter Basseterre, and St George Basseterre. The Parish of St.Thomas Middle Island was the oldest one, and here are to be found the estates such as Wingfield Manor and Godwin's Manor, taken by the earliest settlers, such as Sir Thomas Warner and Captain Samuel Jeafferson, both of whom are buried in the churchyard. Old Road Town, the ancient capital, remained as such till 1728 when the Seat of Government was transferred to the more commodious and salubrious town of Basseterre. This country lies in the Caribbean Sea, south-east of Puerto Rico, and consists of two volcanic islands - St. Christopher and Nevis. I was delighted to get your letter last week, and your parcel this (sic). What an excellent tree you have made and the different colours make it far easier to follow. . . . .
but I never came across anything to prove it. DeVere Julius about a year before he died found some Julius portraits at Hampton Court and I went to look at them but came to the conclusion that Julius was the christian name, had they been ancestors they must have come to England with Queen Anne. I read up a good bit about this possibility but I don't believe in it; had de Vere lived (he was a most delightful man) he would have looked it up. . . . . The Moravian Church is also known as the Protestant Church of the 'United Brethren'. It has its first Memorial Day in 1457 after John Huss, A Bohemian Reformer, was burned at the stake in 1415, and his ashes thrown into the Rhine. His followers then broke into different factions, but 10 years later were brought together as one church. This church appointed ministers of their own election and lot, receiving Episcopal ordination from the Austrian Waldenses. The church grew and soon embraced most of Bohemia and Moravia and spread further into Poland embracing three Provinces each with its own Bishop and Synod. Thus the Moravians were a reformed church some 60 years before the reformation in England. By 1627, after much persecution, The Moravian Church had almost become extinct. In 1722 a settlement was set up in Herrnhut in Upper Lusatia (a Protestant Country) and refugees of this religion came here to join together. The followers of this religion formed themselves into a distinct religious society, but one that was still within the Protestant National Church, and took their place among the Reformed Churches. The first Moravian Church in Great Britain was in Fetter Lane in London, 1742. In 1749 they were recognised as a Protestant Episcopal Church, securing privileges in both this country and the colonies. John Hill writes in 2008: I would like to have gone back to the 'origins' of the Julius family, from my research they may have come from Denmark there is a possible link via arms and crests of the Juel family of Denmark. A memorial on the north wall of the south isle of St Mary's church (the University Church) Oxford, dated 26 Sep 1607, has a Latin inscription recording the death of a noble Dane Ove Juel (Owen Julius). From the translation it appears Julius had been 5 months in England and was aged 23. The Arms over the inscription are: "parted per fess wavee azure and argent, in base two barrs wavee of the first, in cheif a mullet of six points or" The crest is "two mens armes holding between them a mullet of six points or" About the coat is written "pie juste ac sobrie unum necessarium"
JULIUS. The Latin Julius, lulius, is app. lulius, a magno demissum nomen lulo. From a Roman family name which was possibly derived from Greek ? (ioulos) "downy-bearded". Alternatively, it could be related to the name of the Roman god JUPITER. This was a prominent patrician family of Rome, who claimed descent from the mythological Julus, son of Aeneas. Its most notable member was Gaius Julius Caesar, who is known for his clever conquest of Gaul. After a civil war he became the dictator of the Roman Republic, but was eventually stabbed to death in the senate. Although this name was borne by several early saints, including a pope, it was rare during the Middle Ages. It was revived in Italy and France during the Renaissance, and was subsequently imported to England. John married Mrs HIBBALS  [MRIN: 217].